A career change caused Kathy Johnson’s weight to balloon – but a commitment to healthier foods and regular exercise helped her slim down. Now, she’s 7 sizes smaller! Most afternoons, Kathy Johnson can be found in her backyard playing soccer. “I spend hours running around with the kids,” says this 26-year-old mom and college student from Vancouver, Washington. 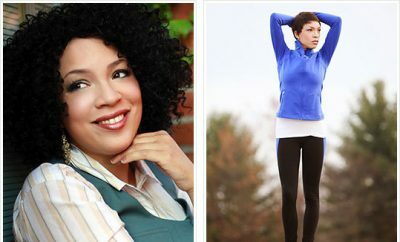 Not that long ago, she weighed more than 200 pounds and avoided exercise altogether. As she was growing up, Kathy’s weight was never an issue. “I’d jog three miles a day and eat normal, balanced meals,” she recalls. It wasn’t until she got married and began working the graveyard shift at a local computer factory that her healthy lifestyle vanished. “I slept all day, sat still all night and ate out of vending machines,” she says. After six months on the job she had gained 45 pounds and was wearing a size 16. In 1994 Kathy discovered she was pregnant with twins and decided to take time off from work. Sadly, she lost one of the babies during her first trimester. Food became a comfort, and she weighed 225 pounds by the time she gave birth. “I felt so unattractive,” she remembers. Still, she continued to find solace in eating and binged on cookies and fast food whenever she needed a pick-me-up. Kathy realized she needed to change her diet. The first thing she did was cut back on butter and fried foods and start eating more fresh veggies. She also began to have breakfast every day, a habit she’d given up when she began working. 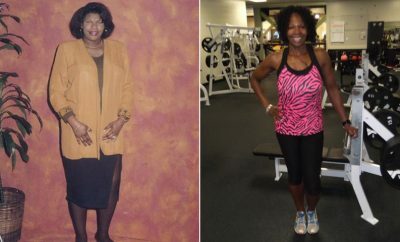 In March 2000, she started walking four miles a day, three times a week. “It was exhausting but worth it,” she says. After only three weeks she joined a walking group. “It’s harder to make excuses not to exercise when you’ve made a commitment,” she says. 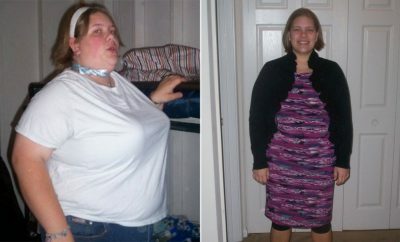 By the end of the year, she reached 136 pounds and was wearing a size 6. Her self-esteem soared. The Workout: Kathy does something aerobics six days a week, either running three miles, taking a cardio kickboxing class or riding her bike 10 miles to her husband’s office to meet him for lunch and then pedaling home again. She does weight training five days a week, switching between her upper and lower body. The Diet: Breakfast is bran flakes with milk and a grapefruit. Lunch is steamed chicken, rice and veggies. Dinner is often a zucchini and mushroom salad with a tuna sandwich on whole wheat.